The AX3010 series are monolithic IC designed for a step-down DC/DC converter, and own the ability of driving a 2A load without additional transistor. It saves board space. The external shutdown function can be controlled by logic level and then come into standby mode. The internal compensation makes feedback control having good line and load regulation without external design. Regarding protected function, thermal shutdown is to prevent over temperature operating from damage; current limit is against over current operating of the output switch that set by outside resistance. If current limit function occurs and VFB is down below 0.3V, the switching frequency will be reduced to 10 KHz; and over voltage protection (OVP) that can avoid high VOUT voltage to damage circuit and capacitor. 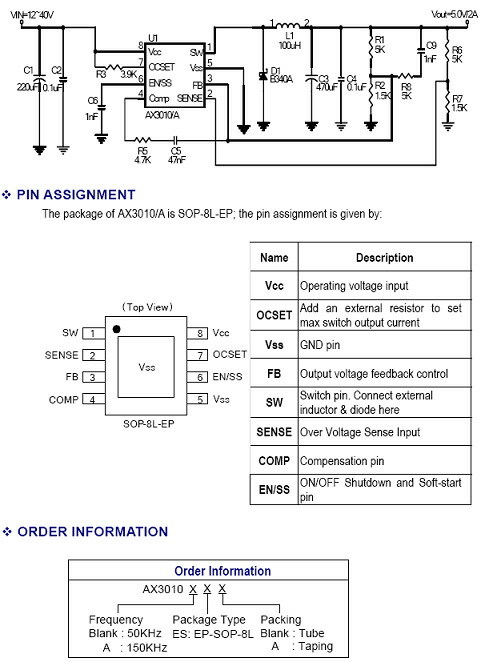 The EN/SS pin supply soft-start function that prevents overshoot and inrush current at startup, the soft-start time is be set up by outside capacitance. The chip is available in SOP-8L-EP package which features small size as SOP-8 with an Exposed Pad to reduce the junction-to-case resistance. - Maximum adjustable output voltage up to 38V. - Voltage mode non-synchronous PWM converter. - ON/OFF shutdown and soft-start control input. - Over Voltage Protect (OVP). - Output load current: 2A.